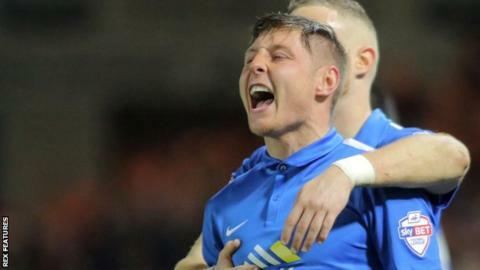 Peterborough midfielder Harry Beautyman believes Posh have turned a corner after a poor run of results. Graham Westley's side went seven league games without a win, before recording back-to-back victories. "We've come off the back of a bad period," Beautyman told BBC Radio Cambridgeshire. "The style of football we were playing seemed to have stopped, but I feel as if the boys are getting back on track now." The 23-year-old midfielder, who missed most of the start of the season through injury, scored his first goal of the campaign in the 3-1 victory over Coventry on Friday. "We seemed to lose our confidence and our way," he continued. "We were sitting down having meetings about where we were going wrong, and it was frustrating because no one could seem to put their finger on it. "As time has gone on I feel as if we're starting to mature a bit more. We've got a young squad but a hungry squad. "This team has what it takes to get promoted out of this league."